Instead of uploading your images to WordPress, you can utilize other services like Flickr or Picasa to easily embed your images without worrying about quota. 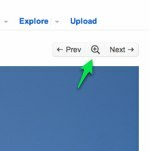 This post explains the process of how to do that using Flickr. The first step is to create a Flickr account and upload your images. Flickr is a freemium image hosting service that allows you to upload 200 photos for free. If you decide to pay for an account ($25 for a year), you can upload an unlimited number of photos at very high resolution. Once you have your images uploaded, go to the specific image you would like to put into a page. Click on the "view in light box" button to view the full image. This will show you a large copy of your image, but you will likely want to choose a smaller version. Click on the "View all sizes" button in the upper right, and you can click through different sizes of your image. Usually you don't want something bigger than 500 pixels wide directly in a post. Once you see the size of the image you want, right-click (or control-click if you use a Mac) on the image and choose "copy image URL" or the analogous option in whatever web browser you are using. Now go back to Wordpress to insert the image into your post. Click at the start of a paragraph you would like to have aligned to the image. Click the "Add Media" button just above your editing window. 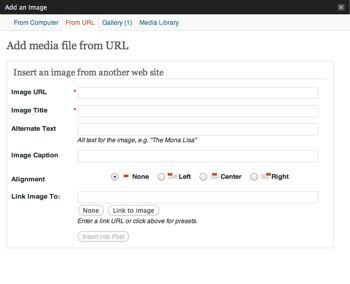 Click the "Insert from URL" tab to get the options for inserting an image by URL. Image URL: Paste the URL you copied in Step 2. Align: None will have no text to left or right, useful for large images. Left puts image to the left and wraps the text around it. Right does the same but with the image on the right. Link To: Flickr likes it best if you include a link to the Flickr image's main page. Put that URL here. Once you've completed the form, click "Insert into Post" and you're all done. You can change the options by clicking the image and then choosing the small picture icon.